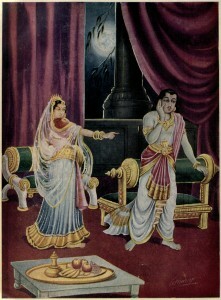 Arjuna visits the heavens to acquire more weapons from his father Indra. Apart from acquiring the skills in using the divine weapons, Arjuna also begins taking lessons in music and dance from the Gandharva Guru Chitrasena. There he meets the beautiful Apsara, Urvasi and Arjuna’s resolve gets tested once again. Listen to this episode below and don’t forget to provide your feedback. All your episodes are wonderful. I hope you come up with something similar on Bhagavad-Gita & Ramayana. 5 stars to you.